I am sure if Fernando Alonso ever came to Manipal he would drown himself at Malpe. No, not because of the food! The reason would be self doubt which would creep in when he would observe the skilled autowallas of Manipal speed through its narrow tracks. The way they maneuver their auto through a crowd, without compromising on speed, is admirable. The roads of Manipal with their puddles and speed-breakers make things even more interesting.If you happen to be seated behind an Alonso or a Schumaker then you can fasten your seatbelts to enjoy a roller coaster ride for a minimal price. 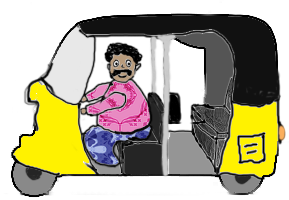 If the driver is a Kartekain, then lets say, the ride is more like the tanga ride of my villiage.It will keep you on the edge of your seat but you will be denied the pleasure of your head banging against the corner of the auto. In the past two years I have personally been involved in a few close finishes.Like that catastrophic day when i had been the cause of preventing a world record from been created.After i had enjoyed my meal at Dollops,i walked towards the other side to appease the urgent need of a cig which one usually has after a good meal.Little did i know that an auto was on its way to complete a world record for the fastest lap between K.C and T.C.The time that son of a holy mother wasted to save my life ruined his effort.That day i had been the cause of wrecking someone’s childhood dream.I distinctly remember the look in his eyes which seemed to suggest that i had wasted so many years of hardwork.After all you can’t be at your best everyday.I was so ashamed at myself for what i had done that it caused more pain than that injury which was inflicted on my left knee due to this unfortunate event.All i could do was to thank him a million times for placing my unknown existance above his all so important record. However the race that thrilled me the most was the one which took place between two champion drivers and i was fortunate enough to witness its climax.When the race was at its most critical stage at Deva ,Alonso while overtaking Raikonnen tried to dislodge my arm to keep it with his other collected trophies. If that auto had been a few cms to the left, my arm could have received the greatest honour that it was ever capable of achieving. In hindsight I think my out of shape arm didn’t deserve it. Of course I went to the gym after that but my labor didn’t bear any fruit. It is obvious that these autowallas follow strict routes, like from TC to KC, DT to MIT etc.You can’t just start your race anywhere you please.The fool that i am,this thought didn’t occur to me. So once while walking towards TC I got tired and unknowingly did the crime of trying to stop an auto in between its race. He just took his hand out and waved like Schumacher does when he is about to win a race. I didn’t eat food that day to punish myself for my idiotic behavior. Did you know that these autowallas have a qualification round to decide pole position. No wonder they are very particular about whose turn it is to drive. Once ignorantly I asked a nearby auto to drop me at 6th block. He pointed his finger to the stand which was about a 100 meters back. I gladly walked in the sun admiring his professionalism. Kudos to the autowallas of Manipal!